The Orlando/Sanford region of central Florida is hope to many attractions. Many people flock to the area in early spring to experience the amusement parks and beaches in the area. Although fun in the sun is a given, another interesting experience isn’t hard to find. The Naval Air Warfare Center Training Systems Division is located in Orlando and acts as the main in-flight training center for the United States Navy’s promising squadron of pilots. 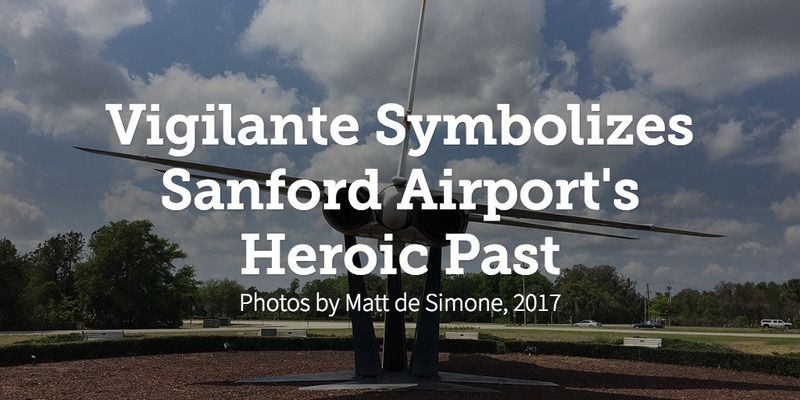 Due to the Navy’s aeronautics division’s strong presence in the Orlando/Sanford area, many visitors and locals have opportunities to get up close and personal with actual aircrafts placed around central Florida like tacks on a map. One of the aircrafts on display is the RA-5C Vigilante—once the fastest aircraft to launch from a U.S. aircraft carrier. The sleek airship could reach to speeds exceeding Mach 2. In the late 60’s, the U.S. Navy restricted the aircraft’s speed due to their own regulations. However, pilots and engineers believed the aircraft had the ability to exceed Mach 2.5. Many naval officers filled the cockpit during the late 1950’s through the 1970’s. In 1969, The Vigilante took part in the London/New York Mail Race–an event which celebrated the world’s first trans-Atlantic crossing. In terms of wartime merits, the Vigilante served the Navy proudly during the Vietnam War. Unfortunately, the United States Navy lost 23 RA-5Cs during the Vietnam insurgence. However, the Vigilante will be remembered for its purpose. Through smoke and fire, pilots of the RA-5C Vigilante gathered photos of the war before and after U.S. military strikes. These photographs proved useful throughout the theatre of war in the South Pacific. Today, an RA-5C Vigilante is on display outside of the Orlando/Sanford International Airport in Sanford, FL. “Whenever I am driving into the airport, the trees break open to my right and there she is. I almost think she’s getting ready to take flight and fire off over the roof of my Volkswagon,” says frequent flier Jerrelle Hamilton of Virginia. Each day, the RA-5C Vigilante display continuously welcomes new visitors. Surrounding the display are facts and other information about the fighter jet, as well as local reptilian wildlife that possibly consider the Vigilante their habitat’s galant protector.